Marguerite Noble, teacher, historian, author and Payson resident since the early 1970’s, wrote nearly 450 one-minute history programs that she then read on KMOG Radio in 1991-1992. Through the generosity of Blain Kimball, KMOG and Roger Buchanan we have the rights to these programs and now have a means to share them with the public. We have used some of the programs for CD’s and video programs, but the bulk of them have not been heard since the early 1990’s. 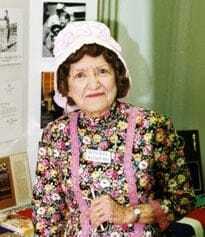 Marguerite Noble was born in Roosevelt, Arizona Territory in 1910. She attended Tempe Normal School and eventually received a master’s degree in education from Arizona State University. After marrying and divorcing Henry Buchanan, having two children and working in the Phoenix schools for 30 years she retired to Payson where she married Charles Noble. Marguerite Noble is the author of Filaree, which was published in 1979, many articles for magazines and local newspapers on local and Arizona history. Some of her short radio vignettes were used to compile Crossing Trails. We will be presenting the entirety of her radio programs, except for those on the one tape that was missing from KMOG’s archives, over the course of the next year or so. After the initial airing of each program, they will be saved on our website. We will be adding more information on Marguerite’s life and work as we go along. We hope you enjoy hearing Marguerite’s voice again, or perhaps for the first time.